Carter wanted to go on a Nature Walk tonight. But instead of traipsing through the woods with the ticks, mosquitoes and fleas, we went on an Alphabet Walk in our neighborhood. We started out with Carter writing the alphabet in two columns. 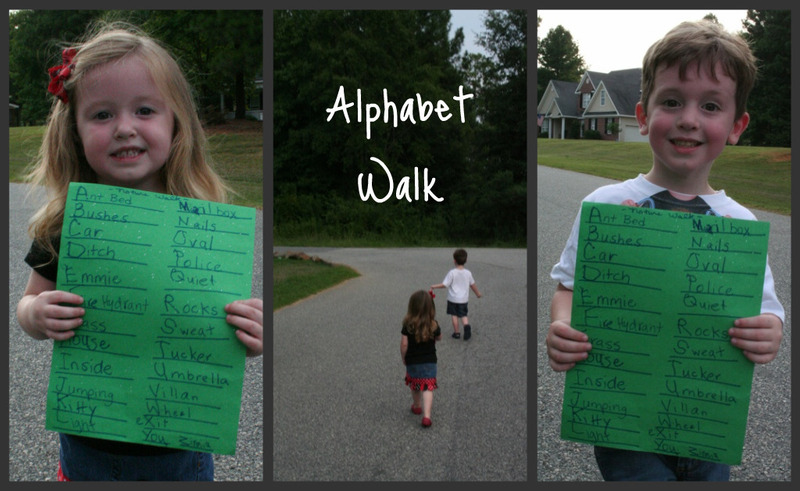 As we went on our walk, we tried to find things that began with each letter of the alphabet. If you click and enlarge the pictures, you’ll see that we got creative a few times. “Quiet” isn’t something you actually see. “eXit” doesn’t begin with “X”, obviously. And, even though I told my kids with complete confidence that “Zinnias” are actual flowers, I was mostly guessing. But since I was pretty sure there weren’t any Zebras roaming around or any Xylophones or Quilts out in our neighbor’s trash…I did what I had to do. yes, dear. zinnias are flowers. score 1 for the smart mommy! and this is the cutest idea evah! i simply must steal it. Love this idea! Will have to remember it in another year or so! And I would totally pretend any flowers were zinnias, because I wouldn’t know eitther! What a great idea! Can’t wait to do this with Abi & Drew next summer! What a great idea and oh, so fun! S is for sweat and V is for villian. I love it! I do stuff like that with my speech kids, but we usually don’t come up with such good words.